STEPPING ACROSS THE THRESHOLD of the Shooting Star cabin in Teton Village, Wyoming, is like entering a refined but cozy cottage. Inside, through the rustic front door, the textures and warmth are striking. There’s a soothing quality to the foyer’s gray-washed, reclaimed wood. The soft glow of daylight filtering through the windows magnifies the weathered beauty of the wood, its color variations, and its grain. But then the eye is drawn to a far wall, where a sculptured stag mount hangs with dramatic impact. Like branches, the horns spread across the wall; but unlike a traditional wildlife mount, the skull is cast in bronze. It hints to a more contemporary approach to rustic design. “The homeowners wanted to create an interior to reflect an elegance and simplicity with some rustic elements, but in more of an alpine decor versus a Western aesthetic,” explained Rush Jenkins, principal of WRJ Design based in Jackson. In building a vision for this family retreat, Jenkins worked with the lady of the house, Marie-France Kern. She and her husband both grew up skiing in the Alps: Kern in France and her husband in the mountains of his home country, Germany. They traveled with their children to Jackson and were enchanted by its world-famous skiing, so much so that they decided a second home in Teton Village was essential. 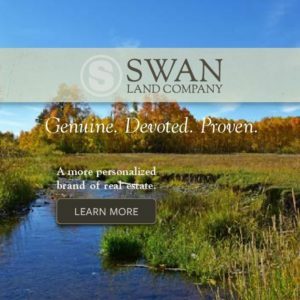 Interestingly, the home is oriented away from what’s considered the landmark view of the Jackson area, the Grand Tetons. Instead, the layout of the home highlights the Tom Fazio-designed golf course that wraps around the other side. JLF and Associates, an architectural firm based in Bozeman, Montana, designed the cabin to celebrate the simple vernacular structures that dot the landscape of the Rocky Mountain West, combining reclaimed wood in a board-and-batten style with stacked-stone accents. The same materials were used structurally inside the house to create architectural continuity. The effect is a feeling of shelter, as the focus folds inward rather than to the towering landscape that surrounds the cabin. WRJ Design worked to enhance that effect by adding a luminous quality to each room in the 5,000-square-foot home. The homeowners and WRJ Design began their working relationship after Kern discovered their Jackson showroom. 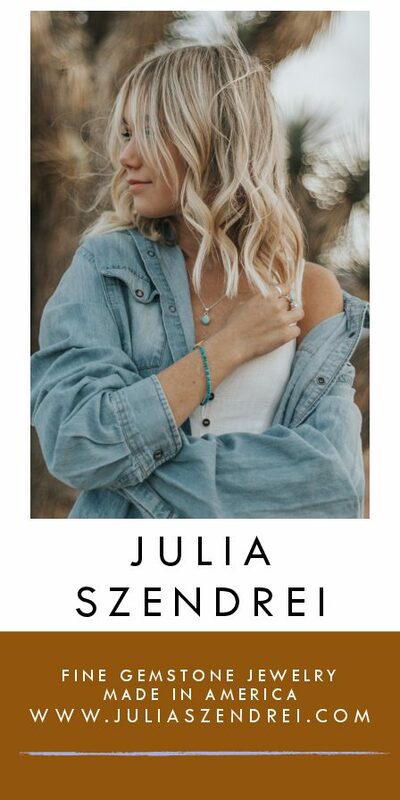 She felt an immediate connection with WRJ Design’s taste and sensibility, as reflected in their displayed collections. They discussed transforming the existing rustic interior of the cabin to express a concept that was more personal to the Kerns, understated and approachable but a little lighter than what already existed. Budget and timeline were discussed upfront and a match was made. “We wanted to create a luxurious interior inspired by the natural beauty of the Teton Mountains, and informed by contemporary European styles to suit this elegant couple,” said Jenkins. Jenkins’s approach to design prizes sophisticated elegance guided by place. He and fellow WRJ Design principal Klaus Baer accomplish this by emphasizing the details in every project. “Detail, detail, detail,” said Jenkins. That mantra shows in this Shooting Star home, where the homage to Jackson’s Western tradition shines subtlety through artwork from local and American artists. 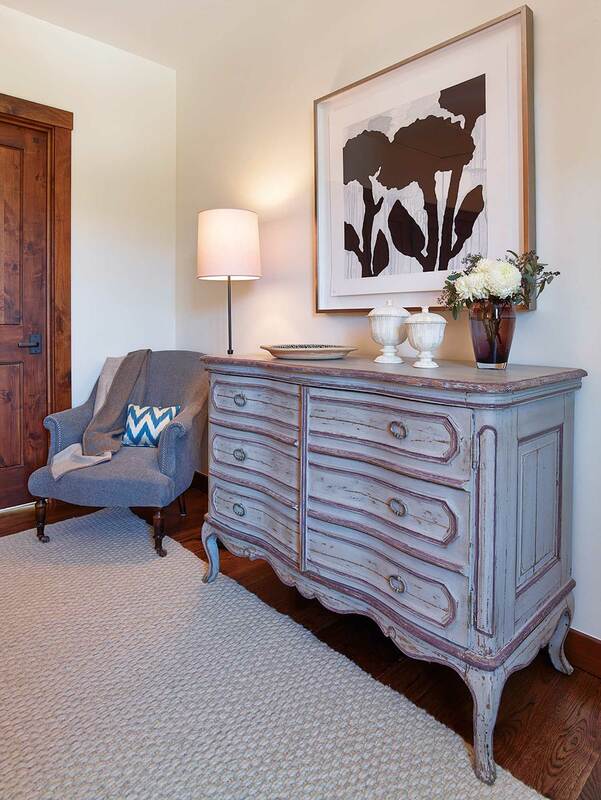 They used collectible works such as Jared Sanders’s landscape above the mantel in the living room, Ashley Tudor’s striking stag mount in the entryway, and a custom walnut end table made by local craftsman Rob Dearing for the master bedroom. Kern also worked with the Tayloe Piggott Gallery to find works that highlight the Wyoming lifestyle. The “story of the cabin” is reinforced, too, by the simplicity of the home. At its heart, where the kitchen, dining, and living areas come together, the texture of cashmere wool drapes, jute rugs, and lushly upholstered mohair couches by Ralph Lauren lend the sense of an intimate gathering space. A stone fireplace anchors the room, where Kern says the fire is always lit in the winter and fall. A striking dining room table made of marble with a Belgian oak base by Sempre is the centerpiece, accentuated by a circular chandelier with exposed Edison bulbs from Ralph Lauren. Milk-white plaster on the walls creates a contrast to the wood and stone elements. This is where the Kern family shares meals, plays games together, and spends most of their time in the house. Away from the action of the kitchen and the main room, the master bedroom is on the main floor. The tone-on-tone palette creates a space of serenity and peace. Kern refers to the room as her sanctuary from the noise and commotion of busy family life. Her husband retreats to his office down the hall where the geometric patterns and pop of red in the Navajo rug and pillows on the couch infuse the space with lively energy. Upstairs, additional bedrooms add another level of respite from the main area of the house. The children’s bedrooms — a hangout space to watch movies or play video games — and a guest bedroom suite continue the theme of texture and warmth. The daughter’s bedroom features touches of pale blue, accenting the palette of warm white, tan, and brown in other spaces. 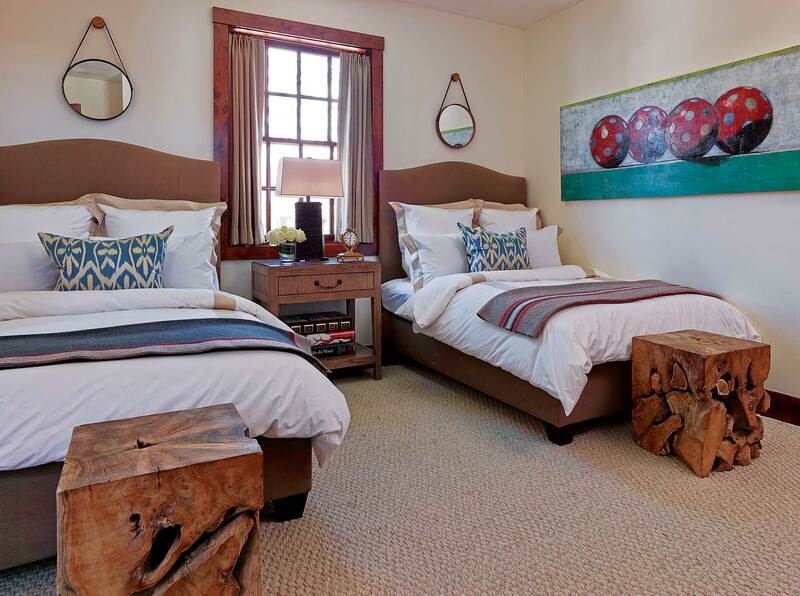 Textural elements in playful accents, such as the cowhide rug in the guestroom, tie back to the aesthetic of the West, but otherwise WRJ Design strove to create spaces that were clean-lined, comfortable, and unique. “I call it contemporary rustic elegance,” concluded Jenkins. In the foyer, an antique-style Ralph Lauren settle with baby alpaca and custom pillows accents the reclaimed wood on the walls. Cashmere curtains allow soft daylight to filter into the space where a Jared Sanders painting connects to Wyoming’s landscape. 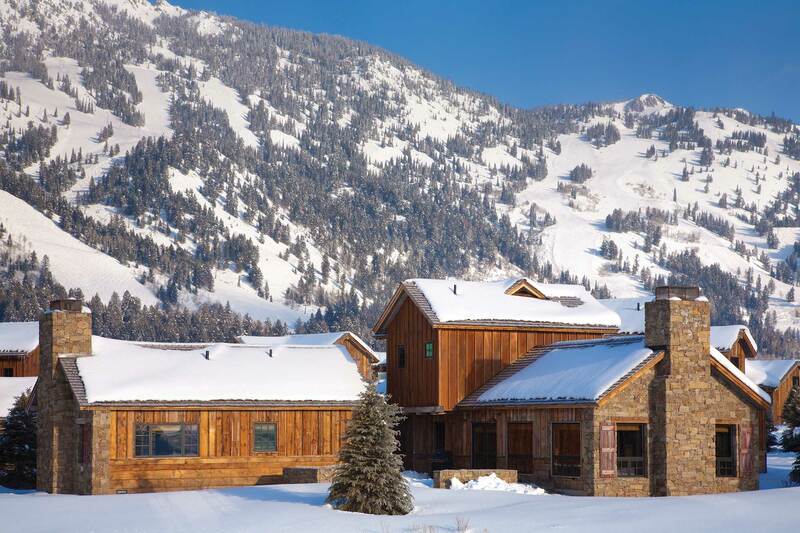 Settled at the base of the Tetons, the Shooting Star home in Teton Village was designed by JLF & Associates to mirror the rustic buildings of Wyoming. Homeowner Marie- France refers to the master suite as her “zen room,” where the milk-white elements have become her retreat from busy family life. 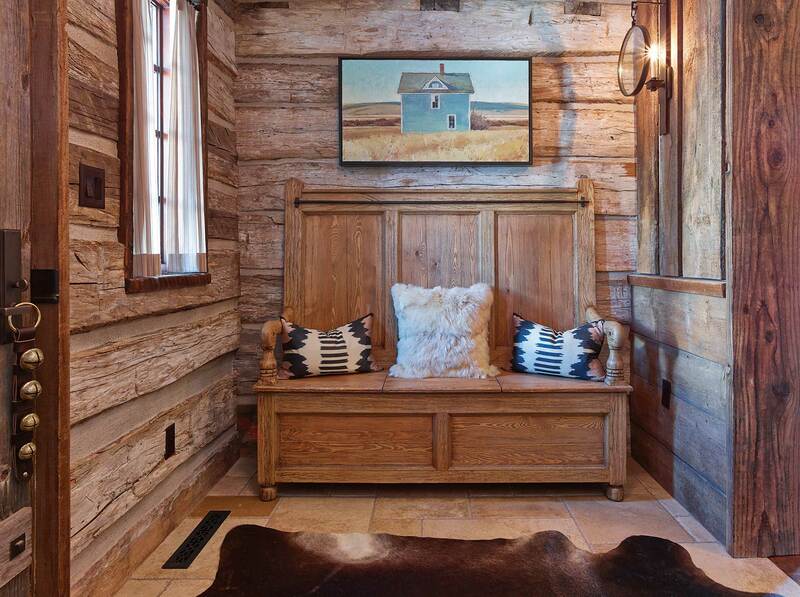 In the office, custom Turkish pillows add a pop of masculine color to the natural tones that flow throughout the cabin. 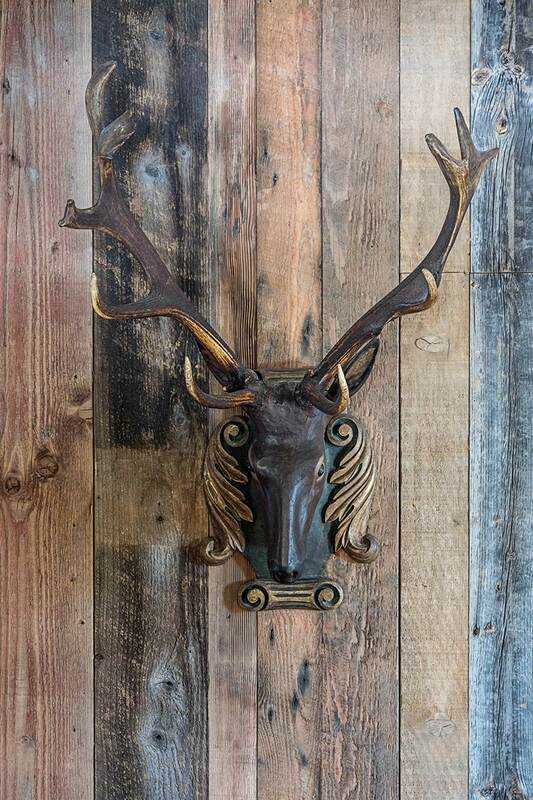 An 18th-Century, wood-carved stag’s head from a rare collection marries rustic and European influences. A French Provincial antique-inspired chest of drawers and chair brings elegant sophistication into the room. In the guest suite, a mohair-upholstered daybed provides a quiet retreat and extra sleeping for visitors. 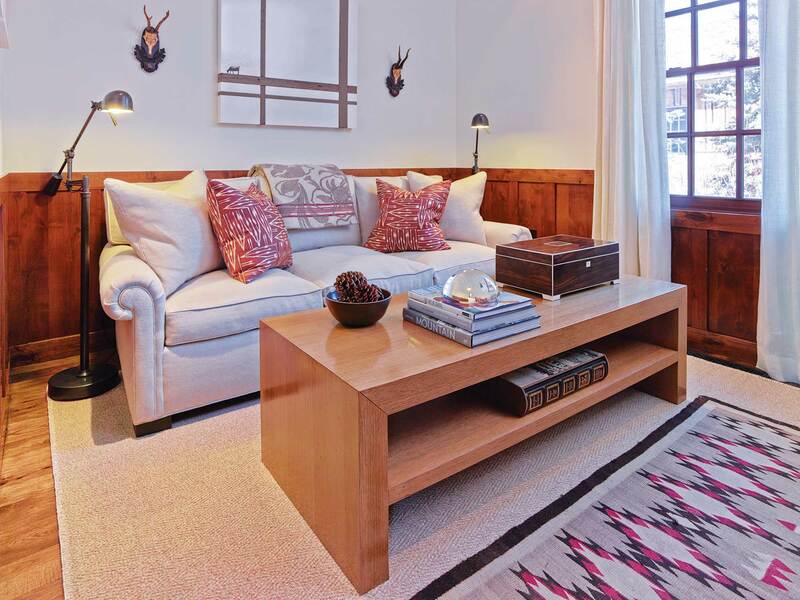 Layers of texture are features throughout the home, including a cowhide overlaid onto a seisel rug. A linen and leather drum shade accents a wine table from Van Thiel and collectible chairs purchased at a Christie’s auction. 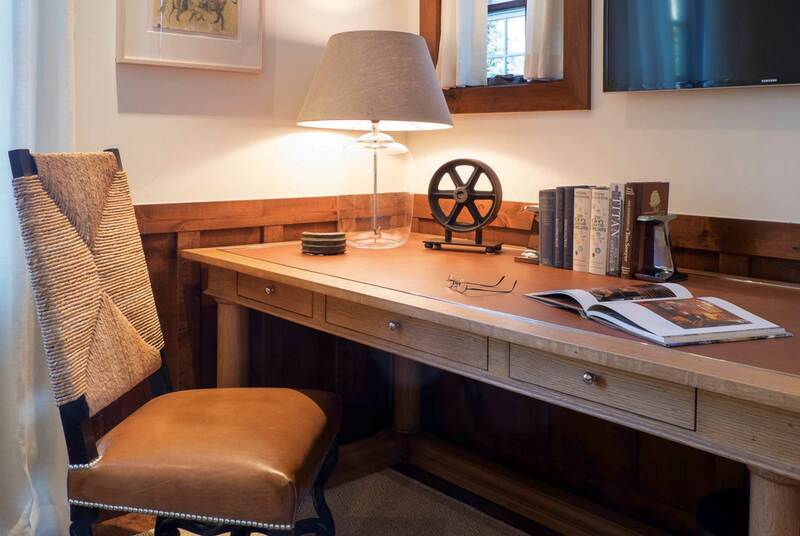 In the office, a leathertopped desk and leathercovered chair add masculine elements to the space. In the boys’ room, rustic elements prevail, but with clean-lined sillouettes, as in the custom-made beds, Turkish pillows, and Loro Piana striped drapes. 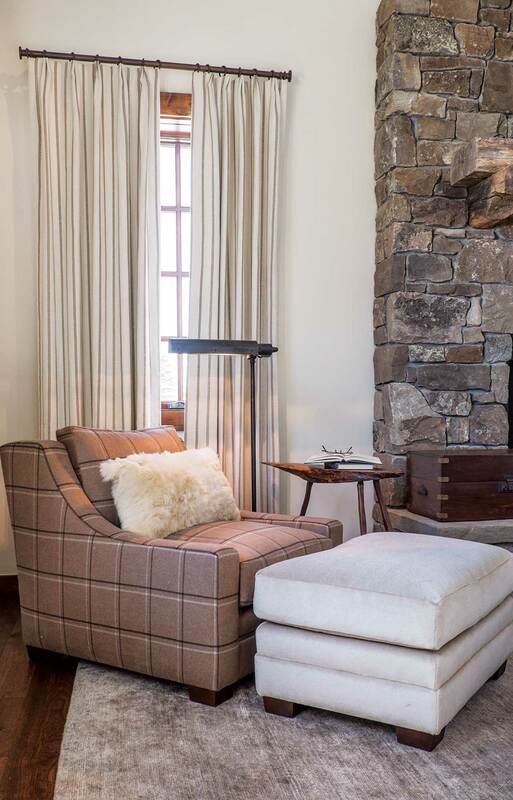 Loro Piana drapes are an elegant backdrop for a plaid Ralph Lauren chair and a mohair upholstered ottoman.